Chairman of the Liberty Korea Party's Emergency Committee Byong Joon Kim stated that they will continue to partner with ioeX to advocate the use of blockchain applications in the future. The Liberty Korea Party's Floor Leader Na Kyung Won emphasized that the characteristics of blockchainsuch as traceability and being tamper-proof can help facilitate party elections with increased success. South Korea National Assembly member and Liberty Korea representative Hee Gyun Song expressed that they wouldn't fear the new technologies. In order to establish a healthy environment for blockchain technology, the party would try best to plan the development, such as legalize ICO and cryptocurrencies. 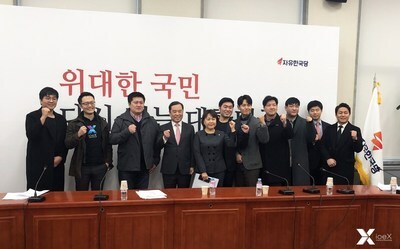 The blockchain voting system will be officially used during Liberty Korea Party's youth committee election in March. ioeX's introduction of the "ioeX Protocol – Decentralized P2P Distributed Network" integrates distributed node network functionality with decentralized blockchain technology to provide a network transfer consensus mechanism solution. ioeX began as a project to reduce operating risk and cost for smart device suppliers by creating a comprehensive ecosystem through a healthy and stable distributed network combined with the ioeX duo-chain (public and consortium chain) system. The ioeX distributed network provides a suite of functions such as X-Cloud, X-Surfing, and X-Talk integrated into the ioeX app so that users can enjoy the full, convenient services within the ecosystem.